In late March, more than 200,000 people marched up the National Mall in support of immigration reform. More than 1,500 of them were there because of the Hispanic Federation, a New York-based nonprofit that works to “promote the social, political and economic well-being of the Latino community,” according to its website. The group sent 33 busloads of people to D.C. for the march. Meanwhile, the Federation has also been spearheading a national effort to improve Latino participation in the 2010 Census---training Census workers, funding outreach centers, and educating Latinos about the importance of returning their forms. These efforts are in addition to its other programs supporting healthcare reform, registering voters, increasing AIDS awareness, and providing emergency assistance. The Federation is able to cover such a wide spectrum of issues through its unique focus on supporting and connecting other Latino groups. Since 1990, it’s built a network of more than 90 organizations serving more than 2 million Latinos. Rodríguez López worked for the New York City Health and Hospitals Corporation before joining the Federation as vice president in 1996. Upon former president Luis A. Miranda Jr.’s retirement in 2004, the group’s board of directors selected Rodríguez López to take the reigns.The daughter of two Puerto Rican immigrants, she grew up in the Bronx. Even as a child, she always felt a strong sense of pride in her community. “I remember having this great source of ethnic pride in knowing that I represented or came from an important community, a proud community and a community that has made a lot of contributions to this country,” she said. 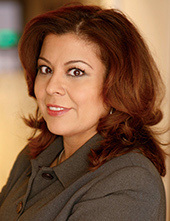 Rodríguez López earned her bachelor’s degree in communication from Fordham University and in 2003 completed Harvard University’s Executive Program through the National Hispana Leadership Institute (NHLI). In addition to her work for the Federation, she also chairs the National Hispanic Leadership Agenda and is a member of the News Corporation Diversity Council and the Wells-Fargo-Wachovia Bank Community Board. In 2008, People En Español named her one of the country’s 15 Most Influential Latinos. Her goal is to address Latinos’ needs at every level, from recent immigrants who may need help navigating the education and health care system, to second- and third-generation Latinos who may want assistance starting their own businesses or finding success in the housing and financial markets. The Federation accomplishes that goal by partnering with other Latino groups and helping them create programs and partnerships with staying power. It’s funded through government grants, corporate donations and private foundations. It also raises money through its 20/20 Club, which asks donors to give $20 a month for 20 months. In the short term, the Census is the group’s largest priority. In the longer term, it’s focused on closing the Latino achievement gap and achieving fair, comprehensive immigration reform. “We’ve got healthcare reform and now we need to turn our attention to immigration reform,” Rodríguez López said. “Immigrants have built this country and will continue to build this country,” and immigration policy should reflect that, she said. On April 29, the Hispanic Federation celebrated its 20th anniversary at the Waldorf Astoria in New York. At the black tie gala, the Federation honored Miranda, its founder, salsa legend Willie Colón, designer Angel Sanchez and Nina Garcia, a judge on the TV show “Project Runway” and the fashion director for Marie Claire magazine. Over the past two decades, the Federation has marked many milestones, like registering about a quarter of a million voters in New York state, and ensuring that undocumented immigrants who lost employment or housing on 9/11 qualified for federal disaster assistance.